Want to get in touch? Give us a ring during our opening hours listed above. We are a small team and at busy times it can be difficult for us to answer the phone as quickly as we would like. If you call and we are unable to answer immediately, please leave a message and we will return your call as soon possible. Alternatively you can email us at the address shown above. 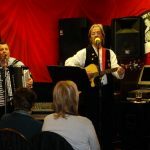 The Accordion Centre is situated 1 mile east of central Birmingham. If travelling by train, we are a short walk or taxi ride from all of Birmingham’s major railway stations. If journeying by car we are just over 5 minutes from the M6 (junction 5 – “spaghetti junction”). There is ample FREE PARKING directly outside the shop. When using sat nav to find your way, you may find our postcode (B9 4DE) directs you to 4-7 Garland Street. This is correct – the shop is on the corner of Garland Street where it joins Midland Street – you can’t miss us! If travelling a long distance, please call us before starting your journey to confirm we are open. There are occasions (for example when we are attending accordion shows) when the shop is closed on advertised trading days.